PDF stamping has proven to be a successful method against piracy. The idea behind it is that it discourages buyers from sharing your product elsewhere online due to their credentials being available for everyone to see. It literally stamps the buyer's email address at the bottom of every single page of the document. 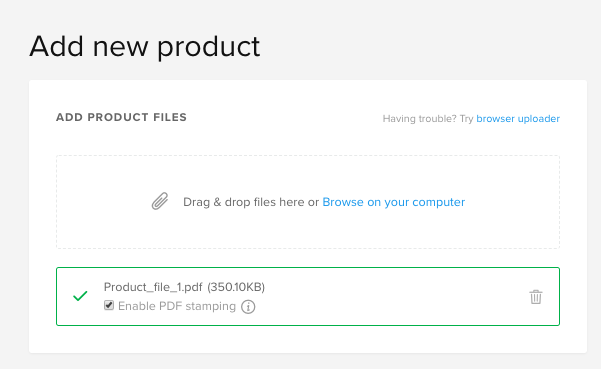 Note: If you're using full-page visuals or other specifically formatted content at the bottom of the pdf document pages and you want to make sure that the stamp won't interfere with that, you may want to test it by downloading your own stamped product from your store. Note: Do not apply pdf stamping to password-protected pdf files. Your customers will not be able to download the file. You can either have the password or the stamp, but not both.